I found this recipe here. While I enjoyed it, it tasted more like tacos to me than chili. Perhaps that is Texan chili tastes. I would make this again as a filling for tacos or taco salad. This is also low carb. I cut the original recipe in half. In a large pot cook the beef and garlic over medium heat. Cook the meat until it is no longer pink. Drain the grease. Next combine the flour, chili powder, oregano, and cumin. Sprinkle it over the meat and stir until evenly coated. Then add the broth, beans, salt, and pepper. Bring the mixture to a boil. Cover and simmer for 1 hour. Stir occasionally. 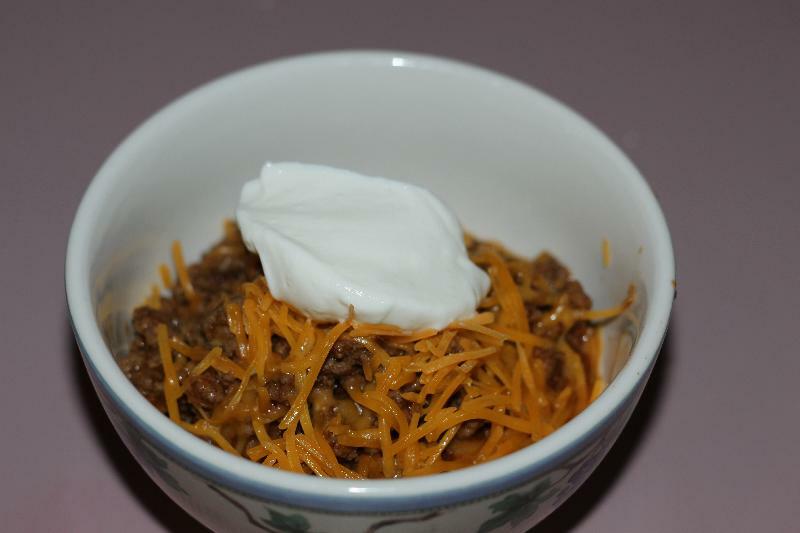 Sprinkle with cheese and sour cream.